The Treasury said Monday it expects net marketable debt to total $425 billion in the fourth quarter, which would bring total debt issuance in 2018 to $1.338 trillion, compared with $546 billion in 2017. That would be the highest annual debt issuance since $1.586 trillion in 2010, when the U.S. economy was still crawling out of a recession. So far, this looks like yet another alarmist piece about the federal debt. I have made my own fair share of contributions of the same kind, such as in September when I noted that the annual cost of our national debt was overtaking the defense budget, or my article on a looming global debt crisis. Last winter, I wrote several articles for the American Institute for Economic Research about runaway debt and economic stagnation. To be clear, there is nothing wrong with sounding the alarm about trillion-dollar deficits and a debt that grows faster than our entire economy. However, it is important to separate the real causes for alarm from events in the economy that are expectable on the heels of a supply-side oriented tax cut. For example, the cut in the tax burden of low-income families and the reduction in the corporate income tax encourage more productive economic activity in the form of labor supply and capital formation. That new activity, however, takes time to come into fruition and add to the tax base. 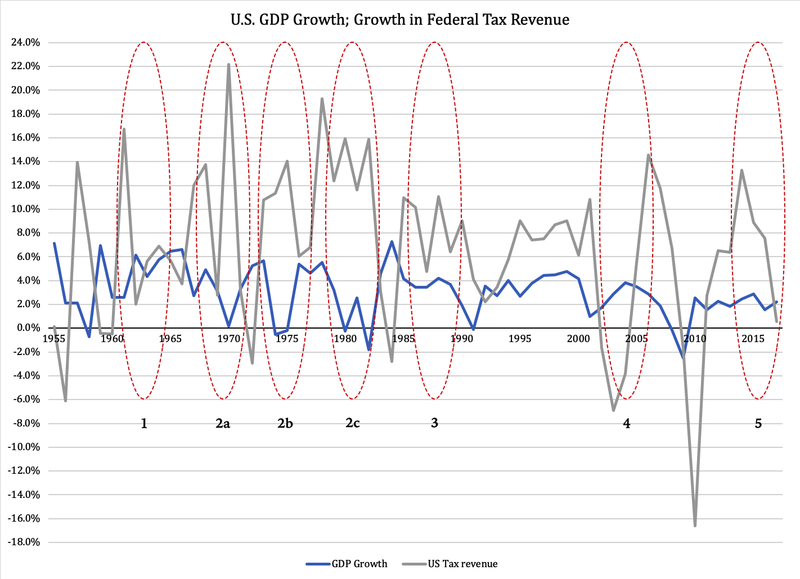 Therefore, tax revenue declines until its growth-stimulating effect has reached all the way to the tax checks coming in to the U.S. Treasury. 1. Kennedy. In an era where four percent growth was expectable over the course of a business cycle, and spikes of six percent were not unheard of, it did not take much of a cut to spark growth. 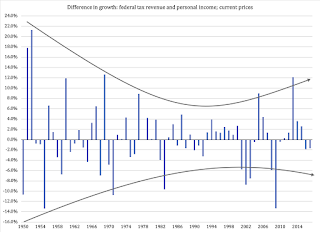 The initial rise in tax revenue when Kennedy was elected originated in an economic recovery in the last year of the Eisenhower presidency, but Kennedy's tax cuts resulted in a more sustained rise in tax-revenue growth in the mid-1960s. 2a, b and c. Inflation. These three episodes, all during the 1970s, brought about sharp spikes in tax revenue while the economy was stagnant, even shrinking. The reason for this is that the personal income-tax system at the time had 25 closely positioned tax brackets, running from a 14-percent rate in the lowest bracket to 70 percent in the highest. Furthermore, the income boundaries of the brackets were indexed to inflation; taxes went up with overall cost of living, while incomes were stagnant. This generated much-deserved resentment among taxpayers. In response, Congress reduced the number of brackets from 26 to 16 in 1979, although the top tax rate remained at 70 percent. 3. Reagan. First, the top rate was reduced to 50 percent in 1982, with a modest tax-bracket adjustment. Economic growth spiked, followed by a growth-driven rise in tax revenue. Then came the major cuts that reduced the number of brackets first to 5 in 1987, then to 2 in 1988. The two tax rates were 15 and 28 percent, respectively. 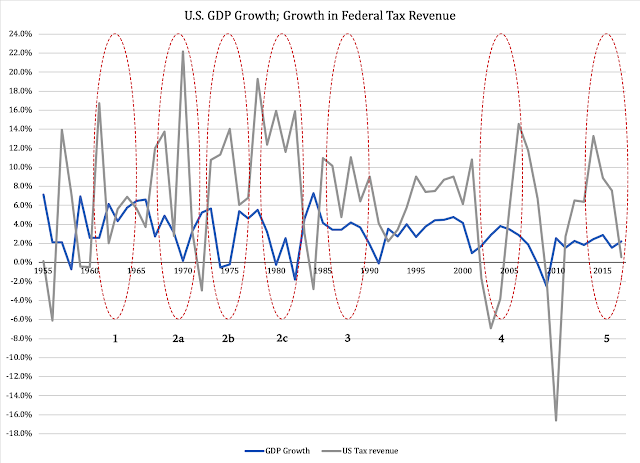 Not only was there a surge in tax revenue, but it was based on solid GDP growth; the Reagan cuts gave the economy enough momentum to sustain full employment and strong government finances through the 1990s - despite Clinton's increases to five brackets with a 39.6-percent top rate. He signed four balanced budgets, for which he deserves recognition. 4. Bush Jr. These cuts actually added a sixth bracket, but the rates fell from fifteen percent to ten percent at the bottom and from 39.6 percent to 35 percent at the top. The effect on the economy was not as strong as it had been in the 1980s and '90s, but there was nevertheless a visible growth effect. In fact, 2005 was the last year to date with at least three percent GDP growth. Nevertheless, tax revenue grew in excess of six percent for four years straight, putting the federal budget on track to balance; had the Great Recession not broken out in late 2008, the budget would have balanced in 2009. 5. Trump. So far, we have only seen the dip in tax revenue under Trump. It is too early to see a revenue spike, but if these tax cuts have comparable effects on the economy to what the cuts under Kennedy, Reagan and Bush had, we can expect a surge in revenue in 2019. The Treasury also plans to borrow $356 billion in the first quarter of 2019, compared with $488 billion in the first quarter of 2018. This would be consistent with a sustained growth trend in the wake of the tax cuts. On the other hand, there are reasons to be cautious about that trend. The tax cuts themselves were not designed to have full-blown growth effects; on the personal income-tax side, the ladder of tax brackets actually tightened, making it even costlier for middle-class families and aspiring entrepreneurs (who for the most part file under the personal tax code) to work harder, advance their careers and make more money. Previous tax cuts have relied heavily on reductions in personal income taxes; with the emphasis being on the corporate side of the tax code, we have chartered new territory. As share of GDP, gross fixed capital formation - business investments - is about one fourth of private consumption, i.e., household spending. For this reason alone, even a sharp cut like the one we saw this year, will have limited effects on economic growth. Furthermore, business investments do not generate end-user spending: if a car costs the same to the buyer at the dealership, it does not matter to him - all other things equal - whether it was built in America or Mexico. That is not to say the injection of new spending, following the Trump tax cuts, do not generate more consumer spending. They do, primarily because unemployment is now below four percent. The problem is, again, that investment-driven growth is more transitory in nature than growth driven by consumer spending. Therefore, a good reform balances tax cuts on both sides, and it reduces the marginal penalty on the personal side of the tax code. In other words, we can raise questions as to how long we will enjoy growth at this level. It is very likely that 2018 will be the first year since 2005 with three-percent growth, but for the reasons just mentioned we should not presume the same for 2019. 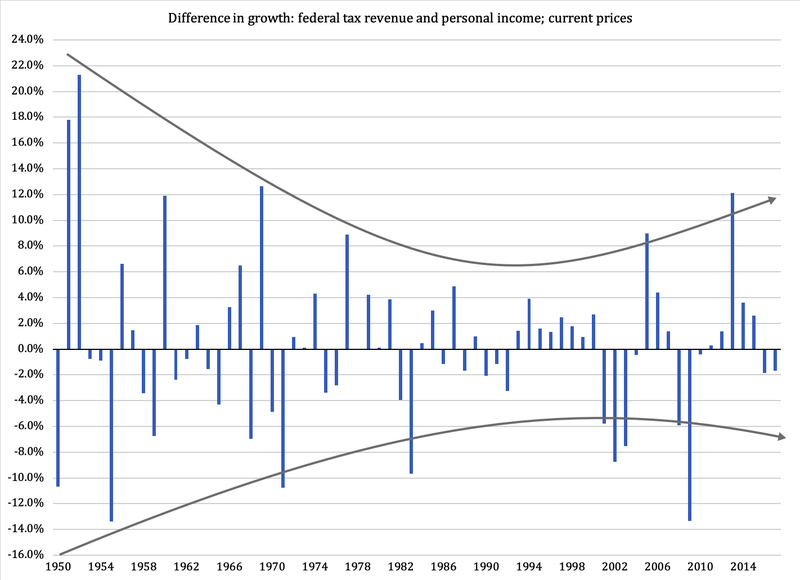 This means, plainly, that when growth slows down, so does personal income - and the following slowdown in federal tax revenue will be a multiple of that slowdown. By consequence, the Treasury has to - you guessed it - drastically increase its borrowing. President Trump has expressed concern over the Federal Reserve's current policy to gradually raise interest rates - a dumb thing to do - but he has also started the long, hard journey toward some sort of fiscal restraint. Depending on what news outlet you prefer, Trump has threatened, requested or proposed five percent cuts in non-defense spending. This is a nice goal, but it remains to be seen if it even materializes. If it does, we have to wait and see if it is a genuine cut, or just a reduction within the budget baseline. Lastly, we will have to ask whether this cut is a one-time temporary reduction or if it is going to be a recurring event. Depending on which way the federal budget goes, we will have different scenarios for the future of the U.S. economy. If the Treasury is right in its prediction of lower borrowing needs in 2019, then the cost of the debt will not overwhelm the federal budget. However, if the Treasury is wrong and the need for borrowing increases, we are going to rapidly move into the trap of a fiscal crisis. That would be the end of the current growth period, and the beginning of an economic period that will make us fondly look back at the Great Recession. A lot is at stake. Trump has the chance to help our economy bridge over the next recession. He also has the chance to break it and send us into a Greek-style economic tailspin. If he can get Congress to agree to sustained spending reforms, he will achieve the former. If he can't, he will preside over the latter.